Shoes aren’t just an accessory, but also a great protection of your foot from dirt and the heat. For that purpose, choosing shoes to fit with your preference and body is important. However, men or women who work at the construction sites need the good quality and suitable shoes for that environment. On the floor, there are many construction materials that we cannot see all, so it can cause dangers if you wear the inappropriate pair of shoes. 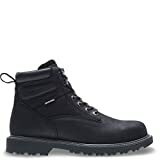 Thus, we have compiled for you the top 10 best men’s work boots that are the most updated with the good quality in 2019. First off, let’s have a look at this pair of men’s work boots that have received stellar reviews; they are from Camel Crown. This baby is available in 3 colors: black, coffee, and golden. All are classic, timeless piece. Material chosen is genuine leather 100%. The sole is made of high quality rubber. As of the leather used, it is oil and water proof. For breathability, the pair made use of mesh lining. Faturing rubber outsides, this one offers plenty of traction. For the user’s convenience in slipping the shoes in and off, the speed-hooks are very useful. This one will make you feel comfortable with all of your movements, walking, climbing, running or standing. Be noted that these boots should be half a size or 1 size bigger than your everyday shoes. Get Camel Crown, and your feet will thank you. When at the construction site, we owe it to ourselves to have our body and feet protected from potential hazards. This superb pair of work boots are offered in 3 color options: brown, black and black nubuck. The material used to craft this pair is genuine leather, which ensures great durability. Indeed, these ones are just durable; they are comfortable as well. They are well cushioned, and light in weight. In terms of the user’s safety, these boots come with toe caps and slip/oil resistant properties. And, they have quite a wide width. The shoes’ shaft measures about 6 inches from the arch. The sole is purely synthetic. Featuring the advanced Am-tech, the outsole of the shoes connect to its upper without any glue used. These boots from Condor will serve you for many years to come. A word of warning; customers have commented that boots can be too small for their feet. Hence, you might wanna go a size up. For peace of mind while at work, you should opt for Maelstrom as well. This gorgeous pair comes in a variety of vintage-ish colors for you to select. Those include different shades of brown, tan and charcoal. All options are durable, well-made, comfortable, flexible, and safe to use. These qualities owe to a number of its outstanding features. Let us describe them to you one by one. The genuine leather used plays a huge part in making these boots tough and adaptable to various situations. Featuring iH20-Tex liner, they provide water resistance to keep your feet dry at all times. The insole is removable which is a plus for your comfort as well. The safety toe cap is equipped, too. These guys are the ultimate highly practical work boots you’ll rarely find on the market. Not just capable of using at construction sites, this one can be used elsewhere, too, because they can withstand even the harshest of environments such as snow or rain or tough terrains. They are breathable and will not make your feet overheat. Plus, for your satisfaction and the user’s confidence, the boots are also backed by a 1-year warranty. Looking for the combination of your safety and your comfort? Lay your eyes on these Carhartt’s super tough work boots. This pair is ideal for not just wearing at work sites but also for exploring the woods. The boots will accompany you everywhere you go while ensuring your safety and comfort 100%. You can stretch and move all you want indoors or outdoors. The rubber sole provides great traction and shock absorbent properties. The pair comes with a nicely padded tongue with many layers of cushions. As of waterproofing, the leather does its job so well. The string ties are well-crafted. Of course, the boots are slip and oil proof. For the price, this pick is just outstanding. For all these qualities, now is probably time for you to get your job done right with safety by using these Carhartt’s boots. If you are in the mood to spend a little more for a premium quality product, do check out the best options from Wolverine. This pair is available in 3 colors – black, wheat and dark down. Craftsmanship is 100% from top quality leather. The sole is the synthetic one. For the measurement from arch to shaft, it measures about 6 inches. The pair is certainly waterproofing as well while being able to easily stand up to the test of extreme work conditions and tough weathers. To offer plenty of traction, these boots feature rubber outsole. As of the wearer’s comfort, the pair comes with a cushioned footbed. They provide a snug fit. They are non-slip and will be at your service for years and years. All in all, this pick will not disappoint you at all costs. Among the top rated brands of men’s work boots stands Kingshow. Kingshow is also one of the most affordable picks out there. The boots comes in an awesome selection of colors in shades of wheat, black, and brown. The leather chosen is the nubuck leather. The exterior of the boots are, of course, oil and water resistant. The boots are great for using at work sites as well as for daily use. This pick is not top-notch. But, after all, you get what you pay for; except for this one, the pair is of a very decent quality. So, in short, if you are not about high, luxurious brands, you may want to give this pair a try. Get the style and functionality that you crave you long for from Timberland PRO. This amazing pair of boots are leather-made as well a long with a rubber sole. They are safe for your feet as well as comfortable and sturdy. The outsole resists water, oil and slips. Hence, you can work with confidence even if the floor is messy or hazardous. Many customers find themselves repeating their purchases because they cannot get enough of them. For the user’s enhanced comfort, they are nicely padded. And, the toe cap is pretty useful, too. Colors available are brown, wheat and black. After all, invented by Timberland, what else do you have to worry about? More than your average shoes, we have here Caterpillar Men’s Second Shift. All colors (brown, honey, and black) are gorgeous. The pair is one of the best sellers from CAT. The boots feature high quality leather and plush collar. They also come with the brand’s logos, giving a great fashionable look. Whether you work on brick, dirt or mud, this one is ready to conquer it all. Most customers commented that each pair lasts about 5 years for them. They also find the steel toe very nice and the stitching very well-done. And, some recommend the buyers to go a size up. The outsole is oil-proof while the rubber used resists slips very well. The boots are nice and let your feet breathe well – thanks to the nylon mesh lining equipped. We believe Cat Footwear will never be a disappointment. Another pair that has received stellar reviews is from Ever Boots. These babies comes in 2 colors – dark brown and tan. The has a rubber insole which is known to be super comfortable for your feet. And, if you have know about the Goodyear Welt Construction; yes this pair comes with that. With this construction, you can always rely on the boots’ durability and utmost safety. The boots will not make tire your feet and ankle – thanks to its ability in eliminating pressure. For added comfort and safety, these shoes have an insole that can be removed and and an outsole made from rubber that is non-slip. Besides, be noted that you should get a size ½ bigger than Timberland or Cat boots. Plus, customers also commented that Ever Boots is a highly responsible and responsive company. For the price, these are the best men’s work boots that all gentle men shouldn’t miss. The item that ranks first on our list is these bad boys from Skechers. The pair offer you safety, comfort, and durability without restricting your movements. They score highly for the top quality leather used, the tough rubber sole, and more. The award-winner, Skechers, makes these boots light in weight, tough, waterproofing and ties that will never get loose. They come with steel toes. Even when encountering sharp things like nails at the construction site, this pair will still hold up well. They offer a great, snug fit. They stay true to their sizing, so you do not have to worry if you need to go any size up. If you get the pair in black, you will find the pair super stylish that some customers have used them when working at restaurants. This pair offer a nice warmth yet let your feet breathe. Plus, offered at this price, this pick is definitely a steal. You have just browsed through the top 10 best men’s work boots of the year. This pick provide all of the functionality you need at work while ensuring the comfort and convenience you deserve. But, our article does not end here. To aid you an informed decision that ensures that you end up with a satisfying purchase, let us briefly guide you through a handy list of buying guides. Read on to learn more. Material and Craftsmanship: For the body of the work boots, make sure they are made from leather (genuine leather). For the insole, they should be made of rubber. The shoes should come with mesh lining as well. And, the ties should be of a nice material and does not go loose easily. The shoes should be padded (multiple layers if possible). The stitching should be a heavy-duty one. These best materials provide optimal quality as well as a good fit. Durability: A number of aspects contribute to the durability of the shoes. Those include the material used, and if the work boots feature Goodyear Welt Construction, the pair must be a bomb. After all, you want a pair that can last you years; instead of months right? Hence, it’s a must for the shoes to be well-made and sturdy. Breathability: The shoes must be breathable. After spending hours standing on hard ground or walking, climbing non-stop, chances are your feet will sweat and can become overheat. Hence, make sure the pair is warming yet breathable. Multi-functional: To make the best use out of your work boots, it’s always good to get a pair that can be worn to different places for different needs. Indeed, some of very best, premium quality men’s work boots are great for daily wear, hiking, or exploring the woods as well. That could be because the pair is lightweight, looks fashionable, or alleviate pressure. Water, Slip and/or Oil Resistance: We cannot emphasize enough how important this point is. The work boots must be water, slip and oil resistance; otherwise they cannot provide you the utmost safety. At work sites, the place is full of hazards. And, we never know what the weather will be like. So, do shop wisely when it comes to what makes your feet safe. 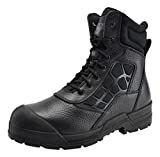 These highlighted men work boots are the high quality products from reputable brands. When at work fields, you’ll never know when you accidently step on dangerous elements that can cause you harm. Therefore, you should decide with care by choosing one pair suitable shoes for safety usage at work. And, these items come with different specifications and features that you can choose depending on your special usage, needs and personal preference. After all, we wish you all the best with your mens work boots shopping. The first men work boots in the list is from the brand Condor. It is made from the real Nubuck leather that looks smooth, elegant and tough to use for a long time. Plus, there are the steel toes to protect your toes from any injury in the workplace because this pair of boots is already tested with a 50 pounds drop. You do not worry about the oil on the floor that could cause slipping because it has the outsole to resist oil or slip. This steel toe boot has the material of Polyurethane in the middle, inside and outside to make you feel comfortable for the whole day, and it is bonded by technology instead of gluing between the footwear to the upper for a long life span. Next, we move to the waterproof work boots from Wolverine brand. This item is also made of leather and the outsole is made of rubber to protect you from slipping or oil in when you are at the construction site. Moreover, you can remove the footbed to make you feel comfortable with or without it for the full day. This boot has the floorhand of 6 inches. Here, let’s check out this awesome pair of slip resistant shoes from Ariat. This shoe really looks so elegant for men because the shaft is measured to be 11.5 inches long with the leather covering outside. You do not concern about choosing it for your working construction because it could prevent from slipping and oil with the tough outsole. This item comes with the new design that is easy for men to wear in and out with the opening around 15 inch. It will not make you feel uncomfortable with the breathable lining and the relaxation insole. Take a look to this man work boot. You will have the trust on the product’s quality with 1-month warranty in waterproof feature by refunding the money back. The leather tries to make your feet dry and your feet warm when you use it in the cold weather. The outsole is rubber that could withstand harsh weathers well, but it is soft to make any movement and be flexible with the midsole of your shoe. The insole and midsole are made of polyurethane to make you feel enjoyable at your workplace. Now we get to know another waterproof work boot from Timberland brand. The company tries to find new things of good quality for the customers. This model is made of the leather. There is the waterproof material covered everywhere even the seam-sealed leather uppers. In addition, it has the antimicrobial treatment to withstand the effects from outside to keep the durability of the shoe. The outsole is resistant to oil and slipping with the material of rubber, and you will find it so relaxing for wearing full day with the interconnected cell of polyurethane. Here is the safety shoe that you can put on for your working. The rubber used as the material is flexible for your movements, and you can also remove the insole to find your comfort in wearing it. Moreover, it is designed to look tough with the shaft of 7 inches. The opening is really big with the measurement around 13 inches that is really to wear or take off. You do not concern about the pain with the whole day with this shoe because there is the support from the midsole and from the ankle by anti-sway bar heel. 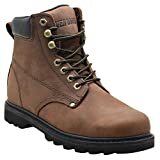 This man work boot is from Skechers brand that has the same material of leather as other shoes, but it looks smooth on the upper with this leather. This product comes really interesting with its design by having 6 eyes lacing and you will notice its small logo on the shaft that is made of metal. With this pair, your feet will feel tired and hurt when moving from one place to another place because it is lightweight. You will notice that this work boot is from the same brand as one product above, but there is the different characteristic of it. This model is not the kind of water resistant, but it is still durable with rubber resistant for the outsole. It is still covered with leather, and you can remove the insole for added comfort. The shaft is measured to be around 7 inches. The special thing from this brand is the 3-month warranty. They guarantee on the outsole not falling off, tearing the rubber in your usual wearing and any separation between the upper and outsole in these 3 months. The Irish Work Boot is designed with the simple look, leather material and the rubber sole. The leather is water resistant for working in damp. Plus, it can resist the electric risk and the heat well. Thus, you will not worry if you accidentally step on the wire with electricity or stand near the fire. The shaft is not too long with the length of 5.5 inches and the opening is around 13.5 inches. Lastly, we reach the last product of mens work boots that is from infamous Caterpillar brand. This steel toe boot is designed for you to see the brand clearly on the shaft with the big logo, and it is made of leather. The outsole is already designed to be tough against the oil and slip in case of any accident. Furthermore, the grommet is designed in hexagon shape to fasten your tying at shaft.